Minimize maintenance & haul-away costs with a solid bowl industrial centrifuge. Separate solids from liquids where removal of fines is important for recycle and reuse goals. 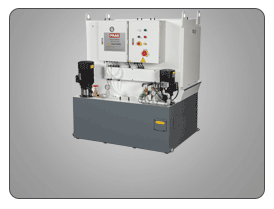 The PRAB industrial centrifuge is ideal for separating all types of ferrous and non-ferrous solids from oils and water-based coolant with flow rates up to 50 gpm. 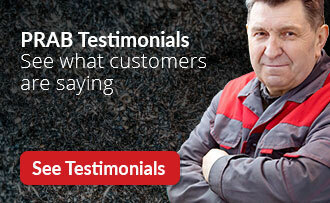 Eliminates consumable media and minimizes maintenance. 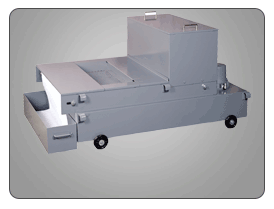 The solid bowl centrifuge provides efficient and continuous operation with low maintenance requirements. 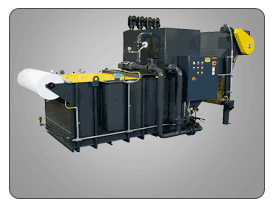 The industrial solid bowl centrifuge offers consistent, reliable operation over long lifecycles. PRAB’s solid bowl industrial centrifuge is specifically engineered for heavy-duty applications, such as chip processing and industrial wastewater treatment. Our centrifuge provides consistent, reliable operation over long lifecycles. The industrial centrifuge effectively separates solids from liquids in metal processing applications where removal of fines is important to recycle and reuse goals. 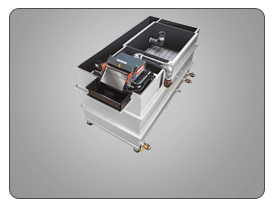 It provides high performance liquid/solid separation for all types of particles including metallic, ferrous, non-ferrous and non-metallic solids. This industrial centrifuge is available in manually cleaned basket style, complete with reusable liner, and fully automatic self-cleaning designs. PRAB’s solid bowl industrial centrifuge is designed exclusively for industrial use. Process liquid is either pumped or gravity fed to the centrifuge inlet. Process solids are centrifugally separated from the liquid phase and collected in an easily removable rotor. Clarified liquid overflows the rotor into the outer case and is returned by gravity to the process. The simple rotor cleaning procedure is accomplished by stopping the liner, opening the hinged cover, removing the liner from the centrifuge, cleaning the rotor, and replacing it. The entire process can be accomplished in as little as 5 minutes with the inclusion of a spare liner.